For this project, I wanted to return to composition, and build on it conceptually. I began at the realization that historically, artists looked for composition in nature: painting landscapes, studying plants or shells, and striving for the idyllic human form. But such works gradually included architecture, and eventually cityscape paintings became a genre. Artists saw that compositional elements existed in architecture, signifying that people seek out beauty in all surroundings. However, there are elements of everything– even buildings– that we cannot see, and this is where I chose to look. “TNCH,” 2014, wood, insulation board, and acrylic paint, 150 x 90 cm. I decided to explore composition in the aerial views of buildings. My idea was to consider how the experience of familiar places from unfamiliar vantage points could change our understandings of them, and I was not surprised to find that most people didn’t recognize the aerial footprint of the very building that they stood in while critiquing the work. I chose Toronto’s New City Hall (Political), Western’s visual art building (Educational), and New York City’s Guggenheim Museum (Cultural) so that the work would be accessible to a broad audience, and still, the inhuman vantage point inhibited the audience’s recognition of the known places. This dislocation of spatial memory is a proof of the phenomenological thesis that all knowledge of the world is based on conscious embodiment: and when we step outside of the known, or experience “indeterminate elements,” there is a space-memory disconnect. I am also, and perhaps more importantly, interested in my own miscalculations of spatial relationships. After I built these paintings I compared the buildings to images on Google Earth, and realized that I gave physical prevalence to the spaces that I had experienced personally, or experienced more often. For example, I gave prevalence to the skating rink at City Hall; likely as a consequence of the time that I spent there as a young boy, before I cared about the offices behind it. This also enforces that our conceptions of space are crafted around consciousness and experience, which is the fundamental claim of phenomenology. My sculpting of these forms from memory resulted in miscalculations that, in a way, truthfully record my own understandings of the places that I have depicted. 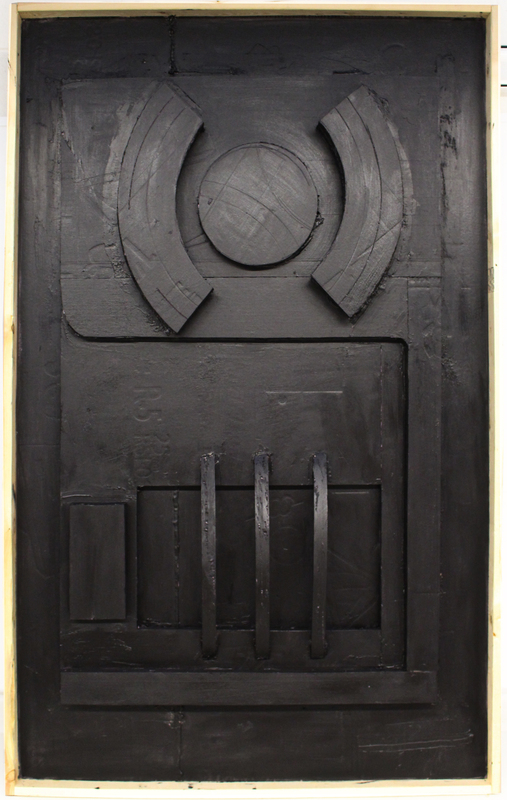 “Poetics of Vantage Points,” 2014, wood, insulation board, and acrylic paint, 150 x 300 cm.